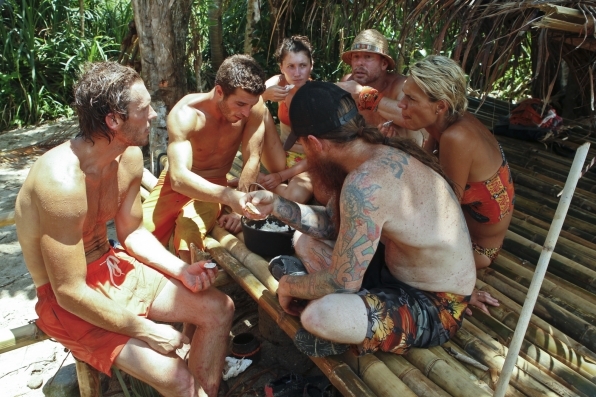 THE STANDOUT: The whole drama in Bikal Camp is a confirmation that SURVIVOR mirrors the reality of life. Yes, it’s a game of outwit, outplay and outlast but if you’re a fan for more than ten years, who has watched every season like it’s your healthy dose of obsession, you tend to realize the various aspects of the game is what you exactly experience in everyday life too. 1. Given the fact this show is only a game, why get personal with Phillip? 2. Is it necessary to scream and humiliate him by saying he made the Final 3 in Redemption Island just because of Boston Rob? 3. It’s already a given situation for which Phillip is acting like a narcissistic man. He enjoys talking about himself but why you can’t swallow what he’s saying and hear him out? 4. If you’re angry with Phillip, why cause a big chaos in the camp and spill the rice – which is the source of nutrition for nine people, yourself included? 5. Can’t you just be angry with Phillip without creating a scene? 6. Strategy-wise, you have a choice to get rid of him by having an alliance outside the Stealth R Us, why not do it? 7. Have you considered seeing a professional? From what the world saw (if the editing is 100% genuine), you might need some help? I’m not in the right position to diagnose Brandon’s bizarre behavior. SURVIVOR is a reality competition show in TV, which means I still need to explore various angles before making any judgment. The conflict between him and Phillip looked seriously entertaining to a point that I seem to realize this type of scenes occur in real life. I also had emotional meltdowns in the past, just as similar as Brandon, but with no cameras around. THE BAD: Brandon’s meltdown is either a bad or good entertainment, depending on how you’ll see it. As I was watching his outburst, I heard a lot of disrespectful words and I got to say it’s too much for Phillip. He doesn’t deserve it. The words are even two much compared to Abi Maria who called Michael an idiot and stupid. Given, if Phillip is annoying as hell then there’s still a way to disagree with his thoughts and with respect and class, right? THE UNLUCKIEST: For three episodes in a row, the Gota tribe was always in misery. Apart from Shamar, there were also rats everywhere, eating them alive while they’re sleeping. The six of them also experienced 48 hours of endless storms. But for Reynold, he went from becoming unluckiest to being luckiest again for finding the hidden idol. Hopefully, he’s using it for the right reason this time. EPISODE RATING: This episode began slowly but it ended with a bomb. Brandon’s outburst was quite predictable considering what I saw in last week’s preview. But man, his emotional breakdown went beyond my comfort zones. 10 of 10 stars!